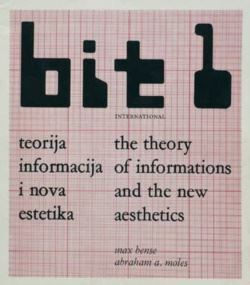 The bit international journal was published as part of the activities of the New Tendencies movement. The objective of the editors was: “to present information theory, exact aesthetics, design, mass media, visual communication, and related subjects, and to be an instrument of international cooperation”. The title, bit international (or only bit) refers to the basic unit of information storage and communication (as introduced by Claude E. Shannon). 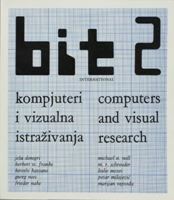 It is short for “binary digit”, a term that has been used in the field of computing and telecommunications since the late 1940s. 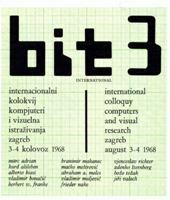 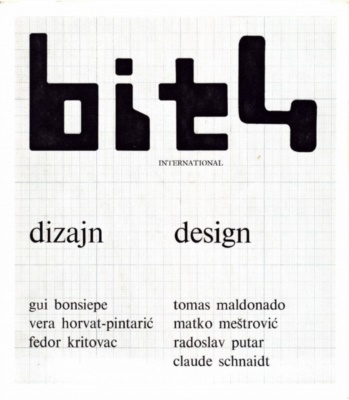 From 1968 to 1972, the Galerije grada Zagreba [Galleries of the City of Zagreb] published nine issues of the magazine (bit international 5/6 and 8/9 were double issues). 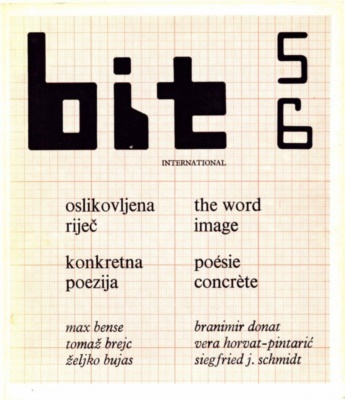 The editorial board consisted of Bozo Bek (editor), curator at the Galerije grada Zagreba, art critic and artist Dimitrije Basicevic, art historian Vera Horvat-Pintaric, Boris Kelemen, curator of the Galerija primitivne umjetnosti [Gallery of Primitive Art], art critic Matko Mestrovic, film director, screenwriter, and producer Vatroslav Mimica, artist and designer Ivan Picelj, Radoslav Putar, director of the Muzej za umjetnost i obrt [Museum for Arts and Crafts], and architect and artist Vjenceslav Richter. 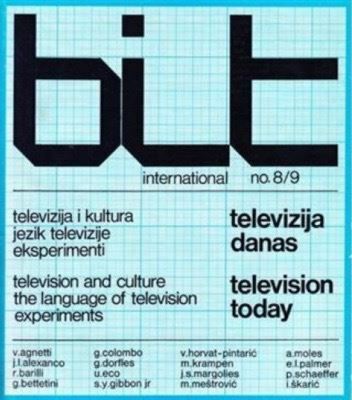 The general manager of Radiotelevizija Zagreb [Zagreb Radio and Television] (RTZ), Ivo Bojanic, joined the editorial board for the issues bit international 4 and 5/6. The editors responsible for the first issue of bit were Basicevic and Picelj. 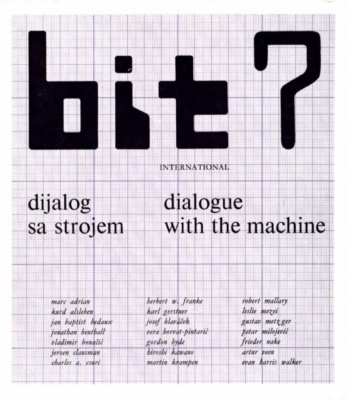 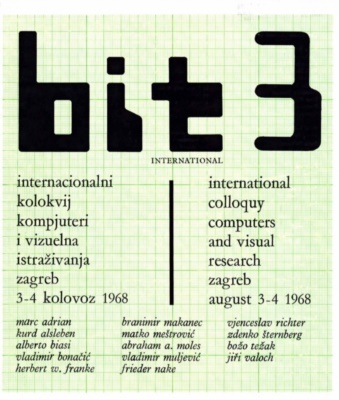 Picelj, who created the design of all the New Tendencies catalogs, also designed bit international. bit international 8-9, television today: television and culture, the language of television, experiments 1972journal was published as part of the activities of the New Tendencies movement. 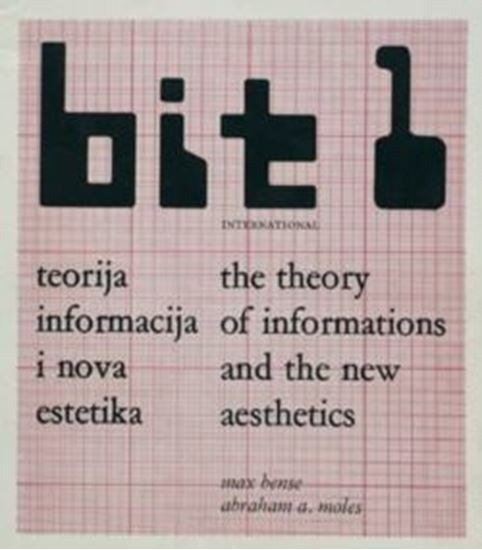 The objective of the editors was: “to present information theory, exact aesthetics, design, mass media, visual communication, and related subjects, and to be an instrument of international cooperation”.